FAQ: Do you have auto-off digital multimeters with audible continuity testing to help install your Rollertrol™ shade & blind motors? 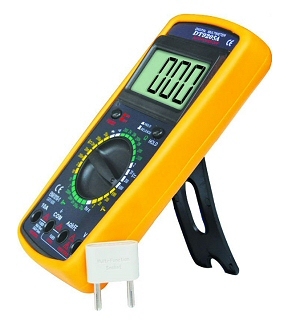 When we went looking for a digital multimeter for bench testing our blind motors and related circuitry, there were three 'must have' features we wanted: auto-off, audible continuity testing, and large readable digits for the LCD display. There is nothing more frustrating when you need to check something in a hurry, only to find that you left your meter on and the batteries are dead! 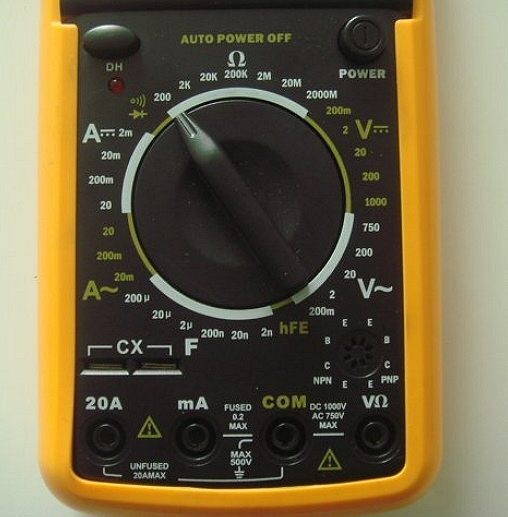 An auto-off feature on a digital multimeter is a very helpful thing. We also do a lot of continuity testing and short circuit detection, particularly when we are making prototype Arduino printed circuit boards (PCB). Having an audible beep or tone sound when checking for shorts is also a very helpful feature because you can keep your eyes focussed on the unit you are testing instead of continually having to look at the meter. It used to be that you could only get these features on high end multimeters, but at $34, here's a unit that does it all at a price that won't break the bank. In fact they are so affordable, we bought 4 of them and put one at every testing station so that we don't have to move them around. We sincerely hope you enjoy using this practical, affordable test equipment; if you have any questions, please feel free to contact us at any time!